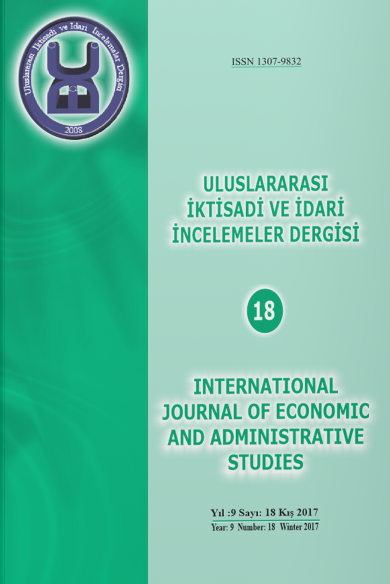 This paper analyzes the determinants of Foreign Direct Investment (FDI) in the food products sector in Turkey. An Autoregressive Distributed Lag (ARDL) model is applied to the monthly data over the period of January 2009 to December 2016. In the model, FDI inflows are modeled as a function of the degree of openness, exchange rate, export price, and wage rate. The empirical results confirm there is an evidence of a long-run equilibrium relationship among these variables in Turkey. Findings indicate that the degree of openness and export price have a positive sign and are statistically significant, while the wage rate has a negative sign and is statistically significant. The error correction term (ECT) of the estimated model is negative (0,92) and statistically significant which indicates that deviations of actual FDI from the previous period’s shock will be converged to the long-run equilibrium. Bu makalede, Türkiye’ye gıda sektöründe yapılan doğrudan yabancı sermaye yatırımları, ARDL metodu ile 2009-2016 yılları arası dönemde aylık veriler kullanılarak analiz edilmeye çalışılmıştır. Çalışmada; bağımlı değişken olarak doğrudan yabancı sermaye yatırımları ve bağımsız değişkenler olarak da ticaret açıklığı, döviz kuru, ihracat fiyatı ve ücret oranı verilerinden yararlanılmıştır. Çalışmanın sonuçlarına göre, incelenen faktörlerden ticaret açıklığı ve ihracat fiyatı gıda sektörüne yapılan yabancı sermaye yatırımlarını pozitif etkilerken, ücret oranı arttıkça yabancı sermaye yatırımları azaltmaktadır. Hata düzeltme teriminin katsayısı, istatistiki olarak anlamlı ve beklenildiği gibi negatiftir. Bu değer, kısa dönemde meydana gelecek şoklar nedeniyle uzun dönemde meydana gelen dengeden sapmanın %92’sinin bir dönem sonra yani bir ay sonra dengeye yakınsayarak düzeleceğini belirtmektedir. Son olarak, CUSUM ve CUSUMQ testlerinden elde edilen eğriler, %5 güven aralığı içerisinde olduğundan dolayı ARDL modeli analizinden elde edilen katsayılar istikrarlıdır. Amuedo-Dorantes, C. and Susan, P. (2001). Exchange-Rate Uncertainty and Economic Performance. Review of Development Economics, 5(3): 363-374. Atalaysun, M. (2014). Turkey 2014 Food processing ingredients report. USDA Foreign Agricultural Service Global Agricultural Information Report Number, TR 4503. Athukorala, P. and Kunal, S. (1998). Processed Food Exports from Developing Countries: Patterns and Determinants. Food Policy, 23(1): 41–54. Barrell, R. and Nigel, P. (1998). Real Exchange Rate, Agglomerations, and Irreversibilities: Macroeconomic Policy and FDI in EMU. Oxford Review of Economic Policy, 14(3):152-167. Blonigen, B. A. and Jeremy, P. (2011-January). Determinants of foreign investment. National Bureau of Economic Research, Inc, NBER Working Papers:16704. Bolling, C., Neff, S. A., and Handy, C. (1998, March). U.S. Foreign Direct Investment in the Western Hemisphere Processed Food Industry. Agricultural Economic Report, No.AER-760. Borensztein, E., Gregorio, J. D., and Lee, J. (1998). How does FDI affect economic growth? Journal of International Economics, 45(1):115-135. Business Reporter. (2013). A vibrant nation where East meets West: Invest in Turkey. Demirhan, E. and Masca, M. (2008). Determinants of foreign direct investment flows to developing countries: a cross-sectional analysis. Prague Economic Papers, 17(4): 356 -369. Ernst & Young’s attractive survey. (2013). The shift, the growth and the promise. Growing Beyond. FAO. (2015). The State of Food Insecurity in the World 2015. Meeting the 2015 international hunger targets: taking stock of uneven progress. Food and Agriculture Organization of the United Nations, Rome, Italy. Gerlach, A. and Liu, P. (2010). Resource-seeking Foreign Direct Investment in African Agriculture A review of country case studies. FAO Commodity and Trade Policy Research Working Paper, 31. Ghazalian, P. L. and Fakih, A. (2017). R&D and Innovation in Food Processing Firms in Transition Countries. Journal of Agricultural Economics, 68(2):427-450. Gibbon, P. and Ponte, S. (2005). Trading Down: Africa, Value Chains, and The Global Economy, Philadelphia: Temple University Press. Grubaugh S. G. (2013). Determinants of Inward Foreign Direct Investment: A Dynamic Panel Study. International Journal of Economics and Finance, 5(12):104-109. Gurıs, S. and Gozgur, K. (2015). Trade Openness and FDI Inflows in Turkey. Applied Econometrics and International Development, 15(2):53-62. Hallam, D. (2009). Foreign investment in developing country agriculture: Issues, policy implications and international response. Paper presented at the OECD Global Forum on International Investment. Herger, N., Kotsogiannis, C., and McCorriston, S. (2008). Cross-Border Acquisitions in the Global Food Sector. European Review of Agricultural Economics, 35(4):563-587. Jordaan, J. C. (2004). Foreign Direct Investment and Neighbouring Influences. (Unpublished Doctoral Thesis), University of Pretoria. Pretoria, South Africa. Istanbul Chamber of Industry (ICI). (2014). http://www.iso.org.tr/Home/ (accessed April 4, 2018). Maddala, G. S. (2001). Introduction to Econometrics, West Sussex, England: Wiley. Makki, S.S., Somwaru, A., and Bolling, C. (2003). Determinants of U.S. Foreign Direct Investments in Food Processing Industry: Evidence from Developed and Developing Countries. Paper presented at the American Agricultural Economics Association Annual Meeting, Montreal, Canada, (July). Mattson, J. and Koo, W. (2002 – December). U.S. Processed Food Exports and Foreign Direct Investment in the Western Hemisphere. Agribusiness & Applied Economic Report: No.484. Nieh, C. and Wang, Y. (2005). ARDL Approach to the Exchange Rate Overshooting in Taiwan. Review of Quantitative Finance and Accounting, 25:55-71. Peasaran, M. H. and Shin, Y. (1997). An autoregressive distrubited lag modeling approach to cointegration analysis. In Econometrics and economic theory in the 20th century: The Ranger Frisch centennial symposium (Ed S. Strom). Cambridge University Press. Pesaran, M. H. and Pesaran, B. (1999). Working with Microfit 4.0: interactive econometrics analysis. New York: Oxford University Press. Pesaran, M. H., Yongcheol, S., and Richard S. (2001). Bound Testing Approaches to the Analysis of Level Relationships. Journal of Applied Econometrics, 16(3): 289- 326.Pesaran, M. H. and Pesaran, B. (2009). Time Series Econometrics using Microfit 5.0. New York: Oxford University Press. Philips, S., and Ahmadi-Esfahani, F.Z. (2010). Export Market Participation, Spillovers, and Foreign Direct Investment in Australian Food Manufacturing. Agribusiness, 26(3):329- 347. Sanderatne, N. (2001). Columns - The Sunday Times Economic Analysis. (accessed May, 15 2017). Slimane, M. B., Huchet-Bourdon, M., and Zitouna, H. (2016). The role of sectoral FDI in promoting agricultural production and improving food security. International Economics, 145: 50-65. Smith, F. and Häberli, C. (2014). Food Security, Foreign Direct Investment and Multilevel Governance in Weak States. The Modern Law Review, 7(2):189-222. Sridharan, P., N. Vijayakumar, and K.C.S. Rao. (2010). Determinants of FDI in BRICS Countries: A panel analysis. Int. Journal of Business Science and Applied Management, 5(3):1-13. Turkish Statistical Institute, (2017). (accessed May 17, 2017). Turkish Social Security Institute. (2017). (accessed May 17, 2017). The Central Bank of the Republic of Turkey (CBRT), (2017). (accessed May 17, 2017). UNCTAD. (2006). The Least Developed Countries Report 2006. United Nations, New York and Geneva. Waldkirch, A. (2003). The 'new regionalism' and foreign direct investment: the case of Mexico. Journal of International Trade and Economic Development 12(2): 151-184. Walkenhorst, P. (2001). Determinants of foreign direct investment in the food industry: The case of Poland. Agribusiness, 17(3): 383-395. Wilson, N. (2006). Linkages amongst Foreign Direct Investment, Trade and Trade Policy: An Economic analysis with Applications to the food Sector. Paper presented at the American Agricultural Economics Association Annual Meeting, Long Beach, California, (July). Wilson, N., and Cacho, J. (2007). Linkage Between Foreign Direct Investment, Trade and Trade Policy. OECD Publishing.